We recommend checking out our discussion threads on the SureFire M500LT LED WeaponLight (White/White) M500LT-B-BK-WH, which address similar problems with connecting and setting up Weapon & Tactical Lights SureFire. The user manual for the SureFire M500LT LED WeaponLight (White/White) M500LT-B-BK-WH provides necessary instructions for the proper use of the product Optics - Firearm & Field Accessories - Weapon & Tactical Lights. The M500LT LED Weaponlight from SureFire replaces the stock handguard on your M4 rifle or similar short-handguard variants to give you a seamless fit and feel, with the addition of an fully-integrated illumination tool and built-in pressure-pad switch. It features a high-output white 1000-lumen main LED and two white secondary low-power LEDs. The main LED uses a Total Internal Reflection (TIR) lens to produce a tight and smooth beam with a bright center cone of light, without holes or hotspots, and a large peripheral ring that helps to preserve situational awareness. Use the smaller white LEDs for a lower light-signature as you move. Built-in switches on the handguard enable you to operate the light, while keeping a safe and secure grip. On the left side of the guard is a rocker switch that controls the main light's constant-on mode, while on the right are two pressure pads for the momentary-activation of the main and secondary lights. On the back of the light is a disable switch that prevents accidental activation during transportation, or when strict light discipline must be observed. Built to handle repeated recoils, the light is made from temperature and impact-resistant Nitrlon polymer and machined aluminum. The aluminum has a Mil-Spec hard-anodized finish that is scratch, wear, and corrosion resistant. The light is O-ring and gasket sealed to be water resistant. If you own a SureFire weapon & tactical lights and have a user manual in electronic form, you can upload it to this website using the link on the right side of the screen. Box Dimensions (LxWxH) 12.0 x 4.5 x 4.4"
The user manual for the SureFire M500LT LED WeaponLight (White/White) M500LT-B-BK-WH can be downloaded in .pdf format if it did not come with your new weapon & tactical lights, although the seller is required to supply one. It is also quite common that customers throw out the user manual with the box, or put the CD away somewhere and then can’t find it. That’s why we and other SureFire users keep a unique electronic library for SureFire weapon & tactical lightss, where you can use our link to download the user manual for the SureFire M500LT LED WeaponLight (White/White) M500LT-B-BK-WH. 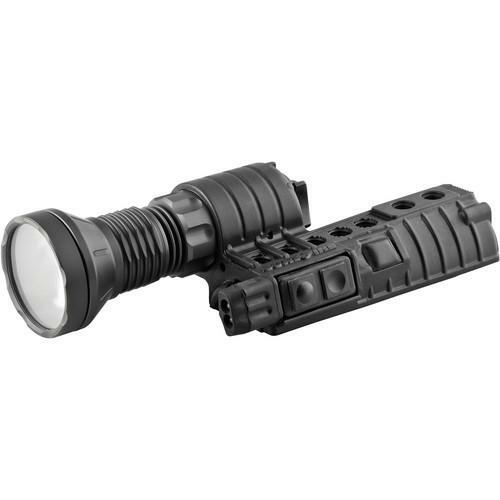 The user manual lists all of the functions of the SureFire M500LT LED WeaponLight (White/White) M500LT-B-BK-WH, all the basic and advanced features and tells you how to use the weapon & tactical lights. The manual also provides troubleshooting for common problems. Even greater detail is provided by the service manual, which is not typically shipped with the product, but which can often be downloaded from SureFire service. If you want to help expand our database, you can upload a link to this website to download a user manual or service manual, ideally in .pdf format. These pages are created by you – users of the SureFire M500LT LED WeaponLight (White/White) M500LT-B-BK-WH. User manuals are also available on the SureFire website under Optics - Firearm & Field Accessories - Weapon & Tactical Lights.